Here’s a classic from the EasyCupcakes.com archives. Vampire cupcakes! 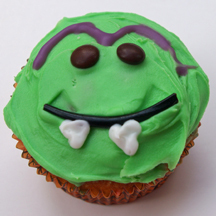 Dracula himself couldn’t help but bite into these cupcakes, which are easy to make with just a few decorations. What You Need: 1 cupcake; icing tinted green; black string licorice; white icing in pastry bag or tube with round tip; purple writing icing; 2 brown mini M&Ms. How to Make It: Frost cupcake. Add M&M eyes and curve length of licorice of mouth. Use pastry bag or tube to pipe triangle-shaped teeth. With purple writing icing, draw hairline shape for widow’s peak like Dracula. 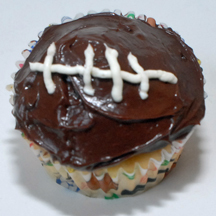 These are the absolute easiest football cupcakes ever posted at EasyCupcakes.com. You don’t even have to make your own frosting; just use canned or even a ready-to-use tube to “pipe” stitches onto the chocolate football surface and you’ll quickly have enough to serve an entire football team — or a Super Bowl Party. What You Need: cupcakes; chocolate frosting; white icing in pastry bag (or sandwich bag with corner clipped off), or prepackaged tube with round tip. How to Make It: Frost cupcake. Use bag or tube to draw a line and then cross it with smaller lines to mimic football stitching. These are super-easy St. Patrick’s Day cupcakes. 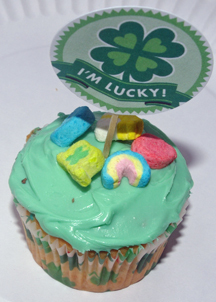 Just assemble the toppers and kids can help make a batch quickly (for school parties) by adding Lucky Charms cereal. What You Need: 1 cupcake; green frosting; Lucky Charms cereal; cupcake topper; large circle punch; printable cupcake toppers (I used Lucky You cupcake toppers from Chickabug, offered free via HowDoesShe.com); glue; toothpick. How to Make It: Download, print, punch, and assemble cupcake toppers (glue two facing toppers onto a toothpick). Stick into top of cupcake. Surround with Lucky Charms. 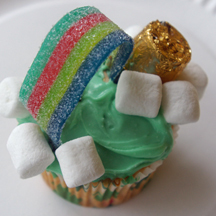 Here’s my take on the rainbow and pot of gold cupcakes that have been circulating around Pinterest St. Patrick’s Day boards. The key is getting your hands on those sour belt candies — I’ve seen them at drugstores such as CVS, but I was able to buy them singly at a candy shop. Yum! My belts were on the soft side; I had to prop up the middle with a toothpick. If you use this, make sure you take them out before serving to little kids. How to Make It: Frost cupcake. Arch rainbow and secure at one end by sticking a Rolo to it with frosting “glue.” Surround each end with mini marshmallow clouds. I used both Star of David sprinkles and a shaped sugar piece on this Hanukkah cupcake. This year, I messed up and baked my Hanukkah cupcakes in my Christmas wrappers and vice versa. Cupcake mixup mashup! 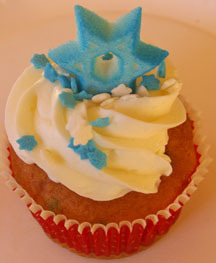 What You Need: 1 cupcake, white frosting, 1M metal tip (for swirl); blue and white Star of David sprinkles; blue star. How to Make It: Using 1M tip, make swirl on top of cupcake. Sprinkle with stars. Add Star of David to top. That’s it! 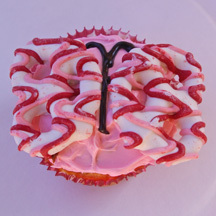 This rattle cupcake, perfect for a baby shower, is a variation of a design seen in a Betty Crocker publication. Change colors and candies for a less feminine look, or for variety. These rattles would also be cute with a baby’s name written on them in icing. What You Need: 1 cupcake; pink frosting; lollipop stick; large yellow gumdrop; 5 small gummy candies; 5 purple candy-covered sunflower seeds; 1 small white candy; 1 white jellybean; length of pink gingham ribbon. How to Make It: Frost cupcake. 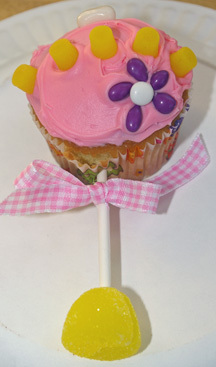 Insert lollipop stick into one side of cupcake, piercing through the wrapper. Stick other end into rounded part of gumdrop. Decorate with candies as shown, or use your imagination!